Listing for 5 - 20 yards of fold over elastic - Assorted Colors - Elastic widths vary around 5/8 inch as we purchase from many different suppliers to be able to offer all these colors. 1 YARD (36 inch) will make 2 headbands per yard. Perfect for hair ties also. 1. Choose total yardage options in drop down menu. 2. 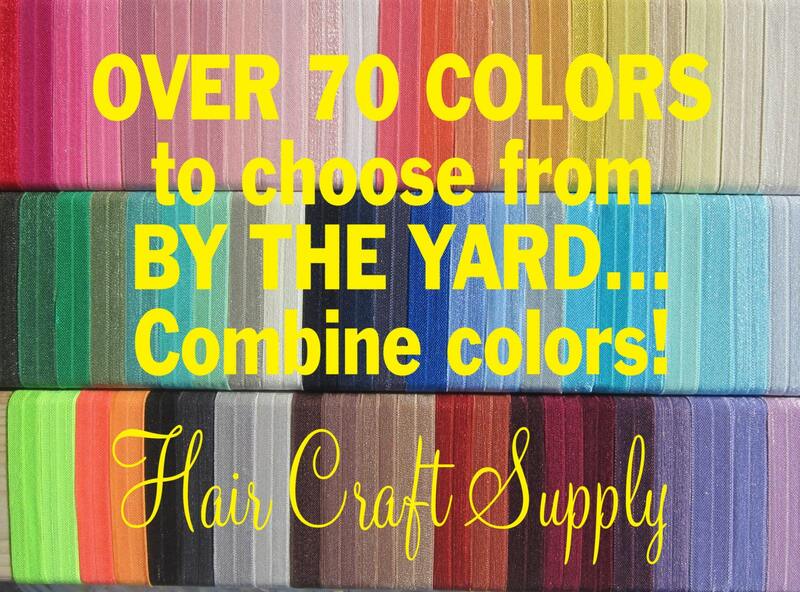 Make a list of color choices - 1 yard increments to total of your total quantity purchased. 3. Add listing to shopping cart and leave the note to seller with color selections and amount of each color. Please check SOLD OUT/OUT OF STOCK color on list below prior purchase. If you choose an out of stock color, we reserve the right to ship a substitute of our choice. IF NO COLORS ARE LISTED IN NOTES TO SELLER, WE WILL SHIP OUR POPULAR COLORS. COLORS MAY VARY SLIGHTLY FROM COLORS SHOWN ON YOUR MONITOR OR IF VIEWED ON A MOBILE DEVICE. SIZES VARY around 5/8 inch depending on color chosen as we purchase from many different suppliers to be able to offer as many colors as we do. If you prefer a combo pack of these and skinny elastics, send me a message and I will make a CUSTOM ORDER with your choices. Skinny elastic colors show in another listing. Note: Elastic Color Shades may vary from one shipment to the next.